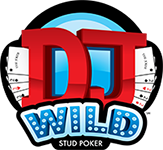 While I was playing Six Card Poker at my local Viejas Casino, another player told be about the Wild Six Card Draw that he plays in Colorado. It’s a poker game with two wild Jokers in the 54-card deck, and the player gets 5 cards plus one free replacement card vs the dealer’s 6 card hand. I ran a Monte Carlo analysis to see if ideal 6-way collusion would yield any edge (you never know, the game has two Jokers after all). But even with 6-way collusion, you can’t get the house edge below 2.2%. I guess that makes sense, since it’s probably rare where you’d chose a weird draw over the more obvious discard. Anyway, it’s really easy to check these things, and you never know what you’ll find. A couple of readers have asked about Galaxy Gaming’s new High Card Flush game, which has a few placements now, and may be picking up some steam. The game is pretty simple, where each player and the dealer receive 7 cards. Each hand is measured by its highest flush, where a flush is first ranked by its length (number of cards of same suit), then by its card values. Each player must Ante before the hand, then wagers a 1x-3x Play bet (depending on flush size), or folds. The dealer qualifies with a three-card, 9-high flush. If the dealer doesn’t qualify, the Play bets push, and the remaining Antes are paid even-money. If the dealer qualifies, the Ante and Play bets receive even-money action against the dealer hand. 3 card, King-high or better 1x if lowest suit count is 8 or higher, else fold. where the suit counts 4-tuple is the sorted number of cards of each suit. When I playing Mississippi Stud in Vegas last week, I overheard someone mention a game called Phil’Em Up Poker. I looked at the game, to see if collusion would yield an edge. The rules are pretty simple. The game is played with a 52-card deck plus a Joker which may be used for Aces, straights, and flushes. Each player bets an Ante, and receives two hole cards. Two community cards are dealt face up. Each player may either make an additional 1x bet (i.e., “double-up” his action), or check, before the 3rd community card is exposed. If a player makes a pair of Tens or better, he wins according to a paytable. There is no dealer hand. The house edge is a reasonable 3.3%. Collusion doesn’t help. That’s because only 3.8% of hands are bet on a draw only. Collusion will change few decisions, and result in little gain. With 7-player collusion, perfect play will only reduce the house edge to 3.2%. On my trip to Vegas last month, I saw this new game at the Venetian, and all I could think of was collusion. I figured it had to be beatable, since the dealer shows half his hand (3 upcards), which should exploitable given confederate card information. Well, I finally got around to looking at it, and of course, its not as exploitable as I hoped. 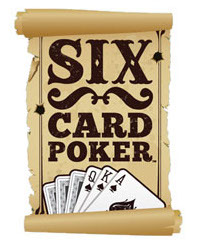 The game is pretty simple, where both dealer and player get 6 cards to make a 5-card poker hand. There’s only an Ante, and a 1x Play bet. The dealer shows 3 upcards, and you decide to either 1x Play or fold your hand. If the dealer doesn’t qualify with Ace-King, then the Ante pushes regardless of the player hand. The 1x Play bet always receives even-money action against the dealer hand. The Wizard of Odds provides a basic strategy, and lists the house edge at 1.27%. I figured 6-player collusion would help you know when to play Ace-high, and maybe help you fold a pair when a lot of dealer outs remain that beat you. But first, I simulated a bunch of hands finding the optimal decision given confederate card info. This gave me a very close approximation to the ideal edge obtained by perfect collusion. This 6-player edge amounted to only +1.17%. This isn’t much, especially since any actual collusion strategy approaching this limit would be impractically complex. Update: I worked out an improved 6-way collusion strategy that yields a +0.43% return with only a couple simple rules. I’m headed out to Vegas next week with two friends, so I re-worked a 3-player collusion strategy for WPT-3X All-In. They probably won’t want to play the game, because one friend loves fast-paced, hi-limit blackjack, and the other friend doesn’t like gambling. Well, I like working out these collusion strategies, whether I use them or not. So, the following 3-player collusion strategy reduces the basic strategy house edge from 0.74% to a mere 0.05% (effectively zero). Of course, you usually raise 3x in this game, so the variance is high relative to the Ante. But, with the casinos increasing the minimum bets, and if you play for hours on end, a zero edge game is much cheaper over the course of a weekend. In fine-tuning the strategy, I found that the low straight cards are important for weak hands like 5-2, and 3-2. For example, if you have 3-2, and are not copied, it’s also necessary that your friends don’t hold any 4,5, or 6’s. I’ve included this requirement in the strategy table, where the asterisks indicate the maximum straight cards seen. Below is the 3-way collusion strategy table for WPT-3X All-In poker. The first table is for offsuit cards, and the second table is for suited cards. You should use the suited table ONLY IF your friends hold at most one of your suits. Otherwise, use the offsuit table. The yellow squares indicate basic strategy folding hands. The numbers in the boxes indicate the maximum number of copies allowed in order to raise the hand. The asterisks indicate the maximum number of straight cards seen, in combination with the max copies. One asterisk allows at most 1 straight card when max copied. Two asterisks requires no straight cards seen when max copied. 3 Player Collusion Strategy for WPT-3X All-In. You have 32o. The chart says 0**. Your two friends don’t have any deuces or treys. You should 3x raise if none of your straight cards are seen (4, 5, 6). Otherwise fold. You have 72o. The chart says 0*. You should raise if your friends don’t copy your hand, AND there’s at most one (3, 4, 5, or 6). Otherwise fold. You have 52s. The chart says 1**. You should raise if your friends don’t copy your hand, regardless of straight cards. However, if you’re copied once, you should raise only if your friends hold no straight cards (3, 4, 6). You have 54s. The chart says 2**. You should raise if your friends hold 0 or 1 copies of your card. If you’re copied twice, then you should only 3x raise if your friends hold no straight cards (2, 3, 6, 7). You have T5o. The chart says you should raise if you’re copied up to two times. Otherwise, fold if you’re copied 3 or 4 times. You have A2o. You should raise even if you’re copied 4 times (i.e., both your friends also hold A2, or they hold 22 and AA). I got pretty excited last week about possibly exploiting Joker information for the new Wild 52 game at the Las Vegas Flamingo. Its a 7-card poker game with a Joker, where up to 6 players hold 5 cards each, and play against a dealer hand. There are 2 community cards, an Ante, and two 2x betting rounds. I figured it was a lock that sharing Joker Busy status with confederates, combined with an optimized strategy both, would yield at least a 5% player edge. So I worked it all out, and was shocked to find only a ~1% improvement from around a 2% house edge to a 1% house edge. The game is played with a 52 card deck plus one completely wild Joker. Each player Antes before the hand begins. Each player and the dealer receives 5 cards, dealt face down. The player looks at his hand, and decides to either Play it by 2x raising his Ante, or folding his hand and losing his Ante. The dealer then turns up the first community card. Based on his 6-card hand, each player either checks, or makes the Option bet (2x the Ante). The dealer then turns up the 2nd community card. Action is complete, and the dealer then turns up his 5 cards. The dealer’s 7 card hand (5 hole + 2 community) qualifies with a pair of 5’s or better. If the dealer does not qualify, the 2x Play and Option bets push, and the player automatically wins the Ante bet. If the dealer qualifies, then the Ante, Play, and Option bet all play even-money against the dealer hand. Play any pair or better. Play any flush draw or straight draw (including gutshots). Play A-high, if 2nd card is at least a Queen, and 4th card is at least an Eight. If the community card is a Joker, only bet trip-8’s or better. Bet any hand with a non-community Joker. Bet two pairs, if the community card is below your top pair, or if your top pair are 8’s or better, or if you also have a straight or flush draw. Only bet a pair of Kings or better if you also have any straight or flush draw. If the Joker is busy, you can play any Ace-high, or 4 cards higher than a Six. Else, if the Joker is hiding, you can only play a pair or better. If the Joker is busy, you can bet a pair of Jacks or better (and Ten’s if the community card is below a Ten). Else, if the Joker is hiding, you can only bet two pairs or better (Jacks up or better, or if the community card is under your top pair). These differences only add up to a 1.2% improvement, and the house edge is still 1.2%. Experienced Pai-Gow players (i.e., those who play every day) often tell each other where the Joker and Aces are. At a full table, 6 players hold 42 cards, so if no one says “joker busy”, then the dealer probably has it (63.6%). Also, if the players don’t hold many Aces, then the dealer is going to have a stronger-than-usual hand. I’ve often wondered how practical and powerful a Pai-Gow collusion strategy would be, so I worked out an analysis of the problem. Immediately, I saw that Ace/Joker info would help mostly for deciding whether to play “pair-pair” (small pair in front, big pair in back) or “two pair behind” (kickers in front, two pair in back). The two pair hands (or other “break/keep” decisions) occur about 20% of the time, frequently enough for a collusion strategy to have some promise. 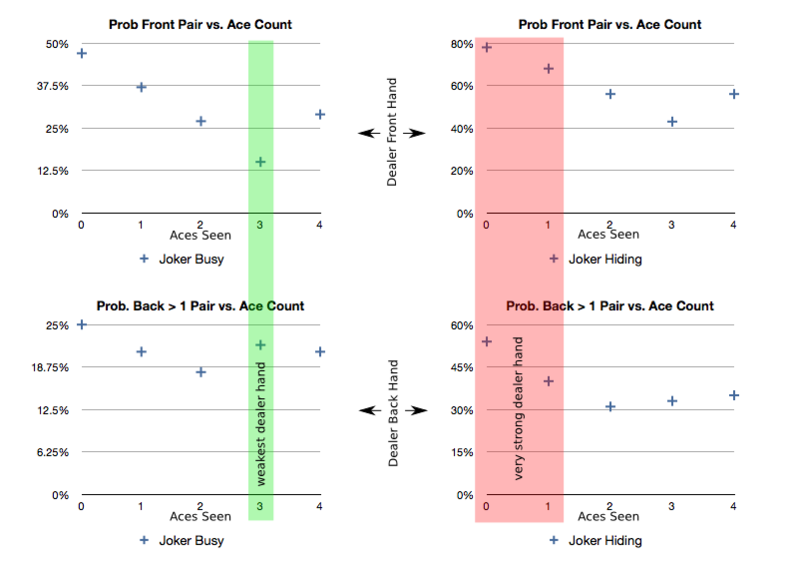 For these two pair decisions, I thought it’d be important to see how the Ace/Joker count affects the dealer front pair %, and the dealer two pair or better behind %. This seemed natural, because I figured if the players held 3 Aces, then the chance of a single dealer Ace was pretty high, which he’d probably play up front (the “3 Ace Effect”). I ran the analysis (CA rules where the Joker is completely wild), and was amazed to see the following results! Probabilities of dealer hands as a function of known Ace/Jack locations (6 players). Sure enough, the expected results pop right out of the graphs. On the left side are hands where the Joker is “busy”, i.e., one of the players holds it, so the dealer cannot have it. On the right the Joker is not busy, and is probably in the dealer’s hand. The top graphs represent the strength of the dealer front hand vs. the known Ace count, and the bottom graphs show the strength of the dealer back hand vs. the Ace count. As expected, the dealer hand is strong when the Joker is not busy. Also, the dealer front hand is weakest when the players hold 3 Aces. As I pointed out earlier, the “3 Ace effect” results from the high probability that the dealer has the remaining Ace, and will play it up front. This is the “sweet spot”. So, we see the weakest dealer hand happens when the Joker is Busy and the players hold exactly 3 Aces (12.5% front pair or better) and the strongest dealer hand happens when the Joker is not busy, and the players hold no Aces (80% front pair or better). This is a huge, huge difference, and suggests a big difference in the right way to play two pairs for these two cases. So, by sharing Ace/Joker information at a full table, you learn when the dealer has either a very weak hand (Joker Busy, 3 Aces seen; most common case, 34.3% of the time), or a very strong hand (Joker not Busy, and 2 or less Aces seen; rare 3% of the time). You should alter your 2 pair decisions to take advantage of this information, as shown below. The following examples show cases where Joker/Ace info would save you around 20% of your bet, on average. Let’s say you have two pairs, Jacks and 5’s, and no kickers: Jd Jh 5s 5d 8s 7h 3c. Normally, you’d play this pair-pair, with a pair of 5’s up front, and a pair of Jacks behind. No one in the world would play 8-high in front, and two pairs (Jacks and 5’s behind). But, in the rare (3%) case where the Joker is hiding, and the players have 0, 1, or 2 Aces, then you’re actually better off playing two pair behind! Now, say you had the J’s and 5’s again, but this time you have an Ace kicker. This is a decision point that people may think about. Most house-way strategies will play two pair behind. You should definitely play two pair behind when the Joker is hiding. However, when the dealer hand is extremely weak because the Joker is busy and exactly 3 Aces are seen (“3 Ace Effect”), ignore your Ace, and play pair-pair. This is normally considered aggressive, but against the weakest dealer hand (the most common case, 34.3% of the time), you should go for it. The “3 Ace Effect” creates the “sweet spot” that minimizes the expected dealer front hand strength. It’s kind of pointless to work out the extreme details of the optimal Pai-Gow strategy given Joker/Ace info. Most people won’t remember the details, or even the broad strokes, given the gory details. However, it’s pretty easy to boil it all down to a simple collusion strategy. The players should first find out if the Joker is “busy” or not. If players have not seen the Joker, then they should play conservatively and favor two pair behind (like house way). If the Joker is hiding, check if there are only 0 or 1 Aces out. If so, the dealer has a very strong hand, so play extremely conservatively. For example, I would play no front and Kings and 6’s behind against the very strongest dealer hand. But the strongest dealer hand is rare 0.4%), so it’s not worth checking for, unless you have a huge bet out there. The Joker is busy 80% of the time. When the Joker is busy, and you have a possible two pair decision, find out if 3 Aces are seen, and thus the dealer has the weakest possible hand (the most common case, 34.3% of the time). If so, play two pair aggressively according to the below table. If exactly 3 Aces seen, the dealer has the weakest possible hand (most common), so play aggressively. where “p/p” means always play pair-pair. Note that this table more aggressively plays pair-pair, because of the stronger-than-normal minimum front hand required to play two pair behind. Most tables require only an Ace for the larger pairs, and only a Jack or Queen for the lower pairs. However, the above table requires not only an Ace, but often AK, AQ, or AJ. Even the smallest pairs require K9 to play two pair behind. This is an aggressive table to play against a weak dealer hand that likely (87.5%) will not have a front pair. Compare the above aggressive table to the more conservative strategy below, where the dealer hand is moderately strong (Joker is Hiding, and all 4 Aces are held by the players). Notice front hand requirements are much lower than the aggressive strategy. This means you end up playing “two pair behind” much more often. This is as you would expect against a stronger dealer hand. I don’t provide two pair tables for all Joker/Ace combinations, but provide these two to show the effect of expected dealer hand strength on how you play two pairs. where “2p” means always play two pair behind. I cleaned up my +EV collusion strategy for the World Poker Tour 3x All-In Hold’Em casino table game, because my old strategy was basically unplayable. I’ve simplified the strategy to focus on copied cards, and to ignore the high cards that only slightly lower the probability of the dealer qualifying. I optimized the strategy for four players, since I wanted a +EV worth playing for. I always see the game at the Bellagio, when I walk through it on my way to the Forum Shops at Caesar’s. It’s also dealt at my local Sycuan Casino. I always tell my friends we should play it, but no one has any interest in +EV play, or carnival games. I figure someone out there sees the value in sharing hole card info for this game, since it starts with a mere 0.74% house edge. The following simplified collusion strategy simulates at a player advantage of about 0.31%. The game is really simple, and other than the bad bonus bets, is not very exciting. Each player posts an Ante to start the game. The player then receives 2 down cards, which combined with the 5 card board, makes a Hold’Em poker hand. The dealer also receives two down cards, for his Hold’Em hand. You look at your 2 down cards and decide to either 3x raise “all-in”, or fold and lose the Ante. Once the players action is complete, the dealer turns up his hole cards. The dealer hand qualifies if it’s a pair, or has a blackjack value of 11 or greater. If the dealer doesn’t qualify, the remaining players win the Ante bet, and the 3x Raise bet pushes. If the dealer qualifies, then he deals the flop, turn, and river. The dealer’s Hold’Em hand is compared to each player’s Hold’Em hand. If the player has the higher hand, he wins even money on the Ante and the 3x Raise. If the dealer has the higher hand, the player loses both bets. If the hands are equal, the bets push. The collusion strategy is also very simple. You 3x raise anything, unless you’re copied. Fold a weak hand (the basic strategy folding hands) if copied. Slightly stronger hands are still played if only copied once. You always play a Jack or better. Additionally, you should fold triple-copied offsuit hands T2 thru T6, 92 thru 96, 82 thru 85, 72 thru 76, 62 thru 65, and 54.